Summary:Adam J Purcell, Andy Simpkins and Keith Dunn sit down, fractured, in front of the 2013 Doctor Who story, The Name of the Doctor, and spout our usual nonsense! BBC: Doctor Who – The Name of the Doctor. Wikipedia: Doctor Who – The Name of the Doctor. 02:13 — Doctor Who: Longer 50th Anniversary Special? 04:12 — Arrow: Summer Glau joins the cast. 05:38 — The League of Extraordinary Gentlemen: Soon to be a Fox TV pilot. 08:14 — Doctor Who: Big screen in some US ‘movie theatres’. 09:53 — BBC: 3D unit being disbanded after Doctor Who special. 12:09 — Doctor Who: Prince Charles is a fan. 13:42 — Star Wars: $10k merchandise forms part of court settlement. 14:45 — Matt Smith: His first car ‘the shed’ up for charity auction. 16:06 – Doctor Who: Trial of a Doctor – The Second Doctor and The Tomb of the Cybermen. 31:32 – Game: Missing Vowels. 34:06 – Steampunk vs Cyberpunk. 50:52 – Game: Connect Four. 87:37 – Farewell for this podcast! 88:19 — End theme, disclaimer, copyright, etc. eBay: Matt Smith’s first car – the Shed. Wikipedia: The Tomb of the Cybermen. Live Journal: Nea’s Mickey, Martha, and the Message that Doesn’t Belong on Who. Amazon.co.uk: Doctor Who and Race book. Amazon.com: Doctor Who and Race book. 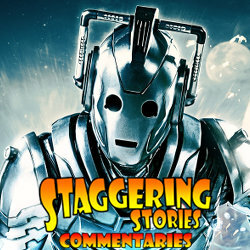 Adam J Purcell, Andy Simpkins and Keith Dunn sit down, upgraded, in front of the 2013 Doctor Who story, Nightmare in Silver, and spout our usual nonsense! BBC: Doctor Who – Nightmare in Silver. 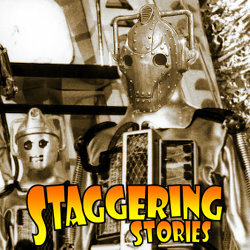 Wikipedia: Doctor Who – Nightmare in Silver. 02:05 — Mark Gatiss: Christmas ghost story, SF documentary – too busy to take over Doctor Who? 05:11 — Christopher Eccleston: HBO pilot – The Leftovers. 07:05 — DEAD! : Richard Matheson and Angus MacKay. 08:45 — BFI: Gothic – The Dark Heart of Film. 10:29 — Doctor Who: Character Options downsized figures. 12:59 — Doctor Who RPG: Fan created non-canon sourcebook. 22:03 – Man of Steel. 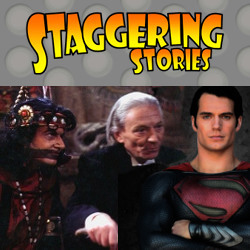 39:52 – Doctor Who: Trial of a Doctor – The First Doctor and The Aztecs. 74:57 – Farewell for this podcast! 75:23 — End theme, disclaimer, copyright, etc. BFI: Gothic – The Dark Heart of Film. Character Options: Doctor Who Toys. Siskoid: The First Doctor Expanded Universe Sourcebook. Huffington Post: Twinkies July Return to the Shelves. The Mirror: Otters who look like Benedict Cumberbatch..